Flowchart symbols actually have their roots in the data processing diagrams and programming flow charts. So, not all the flowcharting shapes shown below may be relevant to your needs. Flowcharts are excellent for explaining complex business processes and can showcase complex processes and decisions visually. Business Process Map aka flowchart diagram is widely used in the corporate world as a tool which can speak and explain complex business decision on a single piece of paper. The flowchart symbol names in parentheses are common alternates for a given shape. Sometimes a flowchart shape can have more than one meaning, as with the Circle shape, which depicts a jump node in flow charts and inspection point in business process mapping. Other times, there are just multiple names for the same flow chart symbol – such as Terminator and Terminal Point. See here a sample flowchart diagram. 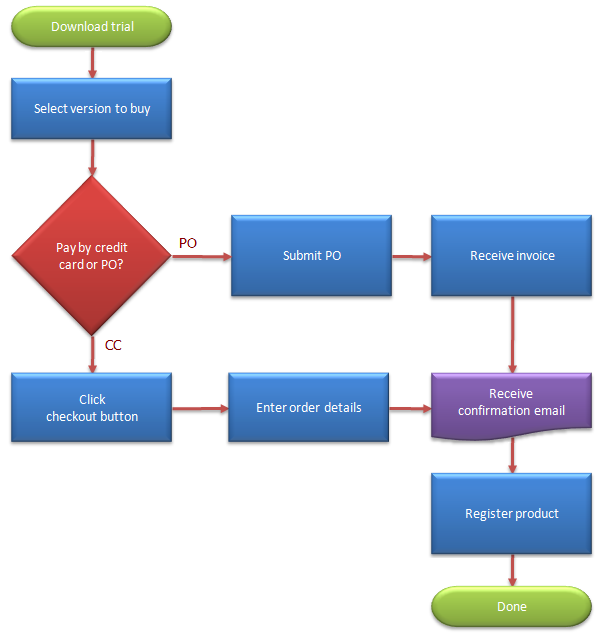 You can also see this helpful guide on how to create a process map flowchart diagram. Process Show a Process or action step. This is the most common symbol in both process flowcharts and business process maps. (Subroutine) A Predefined Process symbol is a marker for another process step or series of process flow steps that are formally defined elsewhere. This shape commonly depicts sub-processes (or subroutines in programming flowcharts). If the sub-process is considered “known” but not actually defined in a process procedure, work instruction, or some other process flowchart or documentation, then it is best not to use this symbol since it implies a formally defined process. Alternate Process As the shape name suggests, this flowchart symbol is used when the process flow step is an alternate to the normal process step. Flow lines into an alternate process flow step are typically dashed. Delay The Delay flowchart symbol depicts any waiting period that is part of a process. Delay shapes are common in process mapping. Preparation As the names states, any process step that is a Preparation process flow step, such as a set-up operation. (Arrow, Connector) Flow line connectors show the direction that the process flows. (Terminal Point, Oval) Terminators show the start and stop points in a process. When used as a Start symbol, terminators depict a trigger action that sets the process flow into motion. Connector (Inspection) Flowchart: In flowcharts, this symbol is typically small and is used as a Connector to show a jump from one point in the process flow to another. Connectors are usually labeled with capital letters (A, B, AA) to show matching jump points. They are handy for avoiding flow lines that cross other shapes and flow lines. They are also handy for jumping to and from a sub-processes defined in a separate area than the main flowchart. Process Mapping: In process maps, this symbol is full sized and shows an Inspection point in the process flow. Off-Page Connector Off-Page Connector shows continuation of a process flowchart onto another page. When using them in conjunction with Connectors, it’s best to differentiate the labels, e.g. use numbers for Off-Page Connectors and capital letters for Connectors. In actual practice, most flowcharts just use the Connect shape for both on-page and off-page references. (Storage) Flowchart: Shows the merging of multiple processes or information into one. Process Mapping: commonly indicates storage of raw materials. Extract (Measurement) Flowchart: Shows when a process splits into parallel paths. Also commonly indicates a Measurement, with a capital ‘M’ inside the symbol. Process Mapping: commonly indicates storage of finished goods. Or The logical Or symbol shows when a process diverges – usually for more than 2 branches. When using this symbol, it is important to label the out-going flow lines to indicate the criteria to follow each branch. Summing Junction The logical Summing Junction flowchart shape is shows when multiple branches converge into a single process. The merge symbol is more common for this use, though. This symbol and the Or symbol are really more relevant in data processing flow diagrams than in process flowcharts. (I/O) The Data flowchart shape indicates inputs to and outputs from a process. As such, the shape is more often referred to as an I/O shape than a Data shape. Document Pretty self explanatory – the Document flowchart symbol is for a process step that produces a document. Multi-Document Same as Document, except, well, multiple documents. This shape is not as commonly used as the Document flowchart shape, even when multiple documents are implied. Display Indicates a process step where information is displayed to a person (e.g., PC user, machine operator). Manual Input Manual Input flowchart shapes show process steps where the operator/ user is prompted for information that must be manually input into a system. Card This is the companion to the punched tape flowchart shapes. This shape is seldom used. Punched Tape If you’re very good at stretching all the life out of a machine, you may still have use for the Punched Tape symbol – used for input into old computers and CNC machines. Stored Data A general Data Storage flowchart shape used for any process step that stores data (as opposed to the more specific shapes to follow next in this table). Magnetic Disk (Database) The most universally recognizable symbol for a data storage location, this flowchart shape depicts a database. Direct Access Storage Direct Access Storage is a fancy way of saying Hard Drive. Internal Storage Used in programming flowcharts to mean information stored in memory, as opposed to on a file. (Magnetic Tape) Although it looks like a ‘Q’, the symbol is supposed to look like a reel of tape. Collate The Collate flowchart shape indicates a process step that requires organizing data, information, or materials according into a standard format or arrangement. Sort Indicates the sorting of data, information, materials into some pre-defined order.